With the D7500 breaking the 20 megapixel barrier, I was slightly concerned whether my lenses would deliver sufficient acuity for the new camera. And this is how the The Artist benefited from the The Accountant's decision to buy a refurb: The money that I saved buying a refurbished camera was applied to a used Sigma 18-35mm f1.8 DC HSM | A lens. I bought my used lens in like-new condition from a very reputable retailer (with a no-questions-asked return policy). The lens is flawless as far as I can tell. I really poured over it and couldn't a single blemish. And over the couple hundred photos I've shot with it so far, it has performed exactly as expected. I've lusted after the Sigma 18-35mm since it first came out in 2013. Besides being the first and, as I write this, still the only f/1.8 constant-aperture zoom lens, the Sigma is also one of the very sharpest APS-C lenses available. It's received extremely positive reviews. I've had a very good experience with my other Sigma "Global Vision" lens, the 17-70mm f2.8-4 DC Macro (OS)* HSM | C. So I'm very jazzed about this new lens. More so than about the new camera, actually! The 18-35mm focal length range is pretty narrow, but it actually fits quite well with where I do the majority of my shooting. In my most common shooting scenarios, I don't need much reach. How does it actually shoot? Well, it's still the honeymoon phase, but I'm impressed. It's not perfect. But it is very, very good. First, the build quality is first-rate. Fit and finish is excellent. The zoom and focus rings, AF/MF switch, lens cap, and hood all have a nice, positive action to them with no extra play. (One helpful hint about the lens hood: Hold it by the ribbed section near the base and it will go on and come off much more easily!) It has a heft that lends an aura of quality that by itself is probably unwarranted, since there's really not much correlation between weight and quality. In reality, the weight of the 18-35mm is more of a disadvantage because it is decidedly heavy for an APS-C lens. But it sure looks the part! The Sigma focuses very fast and in very low light. In fact, the auto-focus speed is good as the Nikon lenses I own. When sticking to the central, cross-type auto-focus sensors, auto-focus is quite accurate. Unfortunately, I can't say the same for the 18-35's auto-focus performance with the off-center sensors. It simply misses focus more. It's mostly an issue at large apertures where the focus really has to be nailed. If I were doing event or sports photography where you have to work quickly and key moments are gone in an instant, I'd either be doing a lot of focus-and-recompose or I'd be stopping down the lens to give myself some depth-of-field buffer. I could probably work with it though because, frankly, I tend to figure out ways to mitigate weaknesses with my gear and I don't spend much time hand-wringing over it. Image-wise, the sharpness, color rendition, bokeh are all outstanding in my opinion. Actually the sharpness is superb, except when the auto-focus occasionally misses as I wrote about above. Even wide-open, the sharpness is excellent. Softer towards the edges of the frame when zoomed out, but still very good. Bottom line, the image quality is fantastic. Having an f/1.8 aperture available over that entire range is a game changer and that's not hyperbole. Within that 18 to 35mm range, the lens levels the playing field with full-frame cameras in my opinion. Consider: The low light performance of full-frame is worth roughly a 1 stop advantage over APS-C for the same image quality. In other words, all other things being equal, a full-frame camera at ISO 3200 has about the same level of noise as an APS-C camera at ISO 1600. Now consider that f/2.8 is the defacto standard speed for quality full-frame zoom lenses. The Sigma is 1.3 stops faster, basically eliminating all or most of that low light advantage. To put a very fine point on it, with the Sigma 18-35mm you can use half the ISO setting because you have twice the light coming through the lens. And with the larger aperture, the Sigma will achieve comparable shallow depth-of-field to a full-frame camera with an f/2.8 zoom at the equivalent effective focal length. Moreover, the Sigma has excellent sharpness wide open. You're not forced to stop it down. The 18-35mm lets you have your APS-C cake and eat it too. So yeah, a bonafide game changer. But only within that 18-35mm range! Sigh. The Achilles heel of APS-C remains focal length coverage with high-end image quality. Currently it's not possible to assemble an APS-C lens set that delivers truly comparable image quality across the entire 14-200mm range that full-frame shooters take as a given. I'm talking about a set of f/1.8 zooms, with class-leading image quality, going all the way from about 10mm to 150mm (which is roughly the coverage of the classic f/2.8 full-frame lens trinity), and with prices that are in line with norms for high quality APS-C lenses. 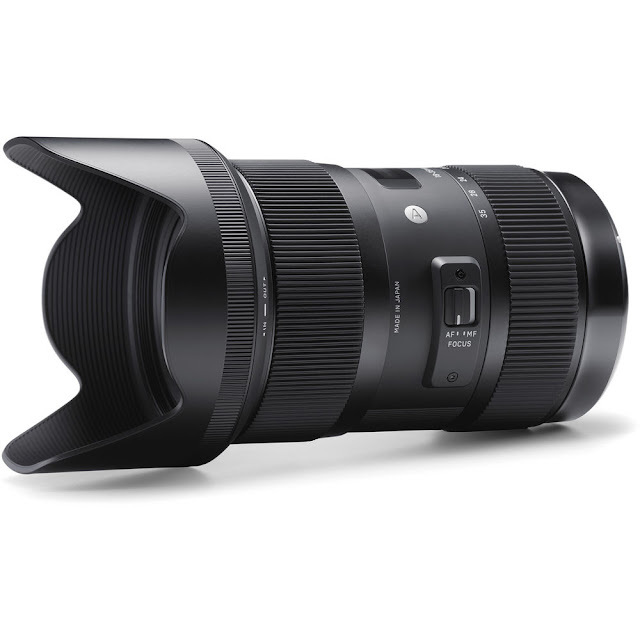 Sigma delivered with the 18-35mm and their excellent 50-100 f/1.8, but huge gaps remain unsolved. They or somebody else needs to complete the set. Perhaps understandably, manufacturers have focused their high-end innovation efforts on their full-frame products and relegated APS-C to "value-oriented" designs. But it would be wonderful if Sigma's success with the 18-35mm motivated other manufacturers to take APS-C as seriously. Prior to the Global Vision initiative, Sigma was perceived as a low-end, budget-focused brand. It seems to me to be a great strategy to move up-market into a niche that Nikon and Canon are reluctant to serve, for fear of cannibalizing full-frame camera sales. Anyway, in my present reality, I still have concerns about whether my ultra-wide and telephoto zooms can resolve well enough for the D7500, but at least my most-used focal lengths are well-covered. Even though there's considerable overlap, right now I think I'll be keeping the Sigma 17-70. That extra reach does come in handy for certain situations, like when I need something small and light for example. My Nikon 35mm f/1.8G on the other hand, I'm less sure about. Right now, I'm wondering if there's anything the 35 can do that the 18-35 can't do better. On the other hand, it's not like I have a lot of money bottled up in the 35mm. Selling it is not going to fund much of anything. And I suppose there is one way in which the 35 is better than the 18-35. Like the 17-70, the 35 is smaller, lighter, and more discrete. I'm just not sure yet how much utility that buys me. Time will tell.